I’ve seen it online and used some of the site’s helpful travel tips back then. I am not constantly on the road until 2 years ago. I started building my dreams of traveling the world since I was a kid and realized it in 2004. When I left Philippines in 2004, it was for work on board a cruise ship travelling Mediterranean seas and countries. We cruised from Israel, Turkey, Malta, Cyprus, Spain, Greece, Italy, France, and Monaco at the time. After few months working on the ship, I left to work in Italy for 3 years, unfortunately I did not travel Italy then. In 2007, I came back in the Philippines and earned some units in MA in Clinical Psychology. In 2008, I went for a supposed to be 1 week vacation in Bangkok and met an Australian backpacker, we then traveled together for 1.5 years around Southeast Asia (Thailand, Laos, Vietnam, and Australia), when we broke up I came back in the Philippines and worked in a call center. Few months later, my family and I traveled to Singapore for a holiday. I’ve met old friends and classmates working there and they encouraged me to do the same. Three months later, I went to Singapore and worked as a Receptionist in a prestigious internationally acclaimed salon for 3 months, when my work permit was denied, I started my backpacking Vietnam and Thailand on my own. I’ve met people who were trying to convince me to work and teach English in Vietnam, but instead I volunteered (in exchange of free accommodation) because I wasn’t ready to commit long term and to get a taste of how is it like teaching and doing it in a different country. I traveled around Vietnam and went back to Philippines, trying to figure out what I really want to do, I worked in a call center, traveled my own country for a bit, saved, and flash pack Malaysia, Brunei, Indonesia. Routine and some personal relationship pushed me to resign. I told myself, I am ready for a long-term backpacking on my own. 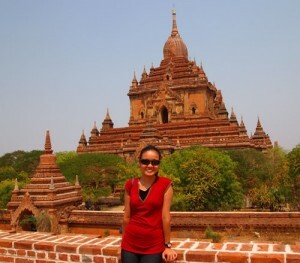 I took a TEFL course as my first ticket around the world. Thailand was my first stop. 4 Days later, I got a job as an English Camp teacher (great for travelers, since we get to different places around Thailand, all expense paid, plus daily pay for only few days a week). That’s where I met my fiancé, and we’ve taught at the same group since then and schools. I just resigned as an Academic Manager of a language center where my fiancé taught as well because of the upcoming Eurotrip to meet his parents. I always work in between, save, and then travel. Like I was a cabin stewardess/bar attendant on a cruise ship traveling Mediterranean. The first backpacking with my ex was from my saving from Italy (for working 3 years and sending family money back, I saved some), then I worked as a receptionist in a salon in SG, then volunteered in exchange of accommodation, worked in a call center to save travel funds, and the most recent was teaching English. Yes, I think I detailed it above. I don’t play favorites anymore, because one place has totally different beauty than the other. They are all beautiful in different aspects and level. Like, Santorini was my favorite; Then Krabi was awesome for beaches and sunsets; Then there’s awesome time traveling kind of experience and amazing people in Myanmar; There’s also wonderful food, culture, architecture, and people in Italy; and active and mystic Bali. Hmmm, I thought I hated Laos because of challenging land travels but when I came back they have progressed a lot! I guess, Hanoi just because they were so intense there and my leg was burned badly by motorbike’s muffler and I didn’t get an apology! You know how Vietnamese city roads are, and if you don’t, try Youtube. Passport, backpack, and an android were my most used travel necessities. Lonely planet books, because they’re expensive, heavy, and it will never be as accurate as some expects it to be (not that I had one my own). I guess when I was starting, as a ‘fashionista’, it was hard to try and live with just whatever can fit in my backpack. You can imagine, how much it changed me. It taught me to live simple and you know what? Living simply actually made me happier. It also taught me how to socialize, coming from a very protective family, I didn’t really know how to socialize especially with guys (studied all my life in a prestigious all girls catholic school from grade school to college). I found out it makes you happy to have good friends. Plus, I realized that the less people have, the more they give. It developed by changing the purpose of my travels now. I used to travel to see the world, and then it became to find me, then finding home. Now, it’s giving back in simple little things, of practicing what I’ve learned and still learning what I don’t. I should have done it earlier. Do it early, do it when you’re still young. Do not forget to bring your common sense and values everywhere you go, you are not worth more than any race or person you will meet on the road. RESPECT. I stopped planning, because the journey got me to unbelievably great places and experience since then. Right now, I’m heading to an unknown world I never thought I will be. HOME. Read more about Lyndsay on her blog, Discount Travel Blogger , or follow him on Facebook and Twitter.